for $4,000,000. The lot size is 10.0000 Acre(s). Prime corner lot recently approved by the Marion County Land Development Use for Community Commercial use. 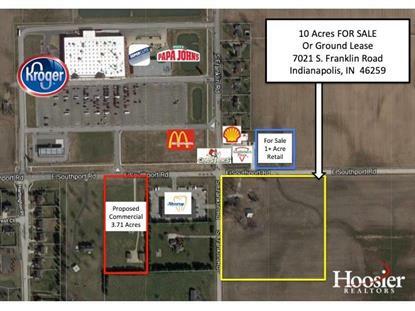 The 10 acre lot is for sale or ground lease adjacent to the newly opened 100, 000 SF Kroger retail center. This is an ideal location for neighborhood retail services as there are strong demographics with high average household income. Located in the center of Franklin Township just .5 miles from the local high school of Franklin Central. The owner would consider dividing up the land.